The I Ching is presented as an oracle. It's the world’s oldest book in constant use. It's wisdom and imagery came from a prehistoric time where the sensation of oneness with nature was probably clearer than today. The concept of the universal whole, the one entity to which we all belong, is referred to in the I Ching as “The Ancestor”. It's proposed he works through all of nature, including the unconscious. The I Ching was designed as a system of divination by which to connect Chinese imperial rule with the Ancestor, from about 1000 B.C. Much later it escaped the Royal court and was made available to the public. Confucius, born 551 BC made a significant contribution, but authorship can be traced back to the sage: Lao Tse. It had been an oral tradition until his time. Chinese myth even links the need for recording divination to the invention of writing. Since the book was buried with early emperors, we know from archaeological evidence, it remained largely unchanged from pre-Christian times until the 1960’s, when Carl Jung’s concepts of Synchronicity, the Collective Unconscious along with his endorsement of Richard Wilhelm’s seminal translation, earned the I Ching a western following. Synchronicity, as the experience of timelessness, available in real time, is the accepted mechanism by which all oracles work. As Jung pointed out in his book about synchronicity, the very existence of the phenomenon requires nature to possess an overarching, timeless architecture, which is something we normally fail to notice. The Einstein, Rosen, Podolski quantum physics conjecture, posits a timeless force or dimension responsible for non-local effects within the quantum field. Its existence was confirmed by Alain Aspect’s team in Geneva 1998. Synchronicity and a known force potentially responsible for it, active within the mind via the quantum field, implies the universe, whether we've noticed or not, operates as the function of a timeless ancestor, to whom we can ally ourselves if we learn to follow him. 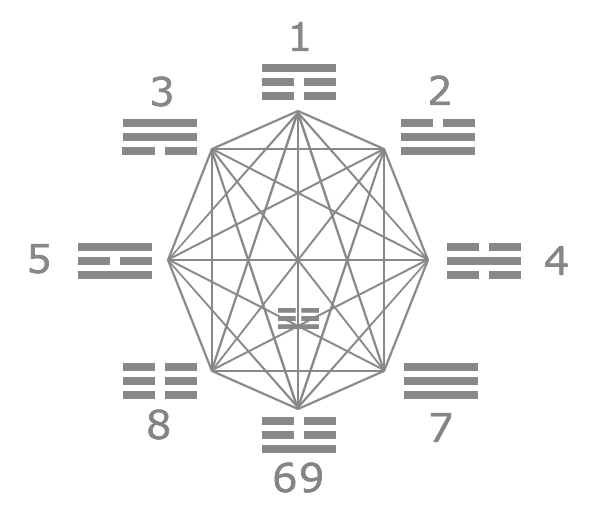 The I Ching contains 64 nuggets of wisdom, each represented by a six line, binary symbol called a hexagram. Each hexagram comprises a pair of trigrams: upper and lower and there are eight trigrams, each of which represents an alchemical element, like fire or water, for example. Each Hexagram meaning results from one trigram combination. The Hexagrams are not the first examples of binary notation in history, but they are the oldest to have made such a powerful impact in our day. They inspired Gottfried Leibniz, inventor of the modern binary code, by which this information comes to you. Leibniz was a contemporary of Isaac Newton. Familiarisation with the wisdom of the I Ching is essential to understanding the meaning of the Pyramid language. EARTH: (AJS) Patient, Tenacious, Adamant and Perverse. LAKE: (BKT) Joyous, Full, Satisfying and Rich. WOOD: (CLU) Gentle, Honest, Progressive and Valuable. WATER: (DMV) Keen, Astute, Intelligent and Dependent. FIRE: (ENW) Mysterious, Dangerous, Profound and Abstract. AROUSING: (FOX-IR) Arousing, Stimulating, Exciting and Insightful. CREATIVE: (GPY) Positive, Firm, Beautiful and Established. RECEPTIVE: (HQZ) Responsive, Meek, Adaptive and Sustaining.